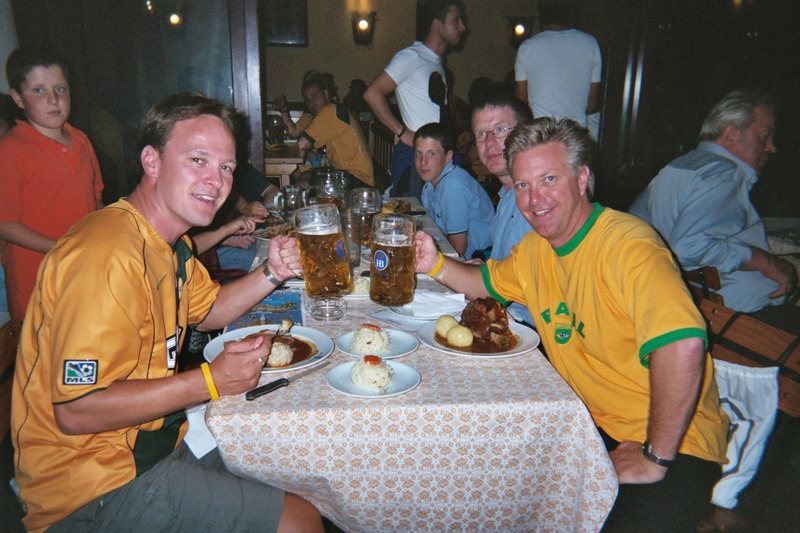 This was the trip of a lifetime: World Cup in Germany, Europe, great weather, good times. My first World Cup, amazingly and what am amazing 2 weeks it was. A lot of time, thought & planning went into this one as well as some good luck in getting game tickets. 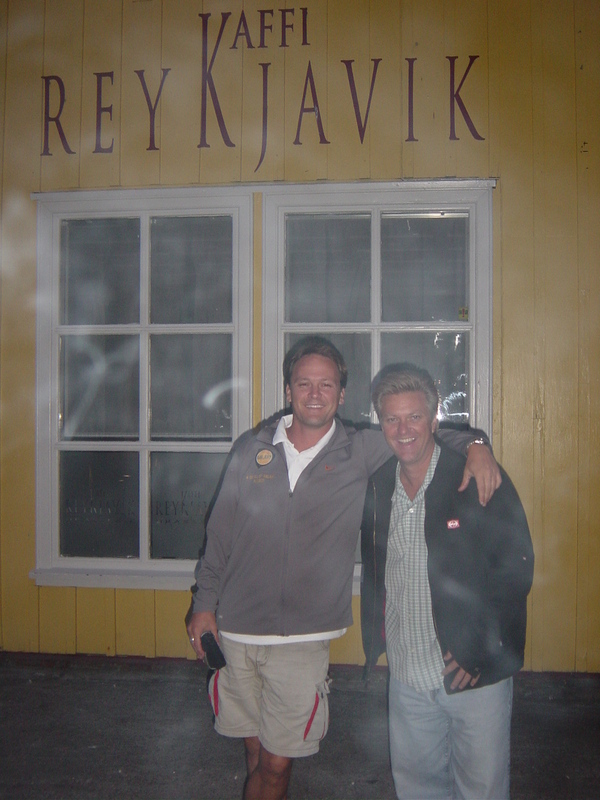 My travel partner for this one was the legendary…or maybe more like, infamous, Erik “SuperSmart”/”SLG” Mikkelsen. Now he wont like this but we all know it, I branded him SLG as it stands for many things he represents: Super Loaded Guy or Super Loud Guy. The SuperSmart thing is fitting and “Smart” became a perfect nickname for our trip because we could yell it out in a crowd and find each other super easy. Example: 1st day of our trip and we are in a PACKED train station in Gelsenkirchen and we lose each other…I hear “smart!” and find Erik a few feet away. Now I’m not sure if I will refer to him further in this blog as SLG or Smart…I’ll be nice and go Erik or Smart. So he lives in Manhattan Beach and is President of Fram Soccer where I play. He ran the Open age team that I now run and now runs the Over 40s who have Rod Stewart on their team. His likes: good times, soccer, drinking, being loud, being right but usually isnt, seeing live bands from the 80s, uniforms with as many sponsor logos as possible, not eating & getting random people to drive us or take our pics. He is a bit like a Gremlin…except his rules are: you have to monitor his drink intake, make sure he eats something, keep him out of the light, dont let him fall, keep an eye on him in public & check his loudness. We have hung out a lot & did the Fram Euro trip together in 2004, so I know him well. So a few months before the tournament started in June we bought our plane tickets on US Air thru Philadelphia and into Frankfurt. The goal was to get tix for all 3 USA games and thus have our travel plans follow their game path. So with the games in Gelsenkirchen, Kaiserslautern & Nuremburg (not the ideal cities we wanted but thats the draw) we narrowed in our stays for Cologne, Heidelberg, Munich & Nuremburg. Now we had to get game tickets which we did not get thru the FIFA Ticket Lottery. But fortune came about 6 weeks prior to leaving as in 1 day I got 2 games, 1 via a later USA ticket allotment lotto & the other thru soccer connections. We later got the 3rd game thru a friend selling his. So going in we at least knew we had all 3 USA games plus we were hoping for Brazil vs Australia tix. As I picked up SLG on way to the airport he came walking out of his place and has a long flight of steps to come down outside…he had his bags on him and as he hit the 4th step he slid down about 7 of them before he caught himself…good start. On our 1st flight to Philly I had the window, Smart the middle and some lady the aisle…and my crappy seat wouldnt recline…which gave SLG plenty to laugh about the whole way. We got to Philly and had some time so grabbed a beer to celebrate the beginning of our journey and then boarded for our overnight flight to Franfurt. 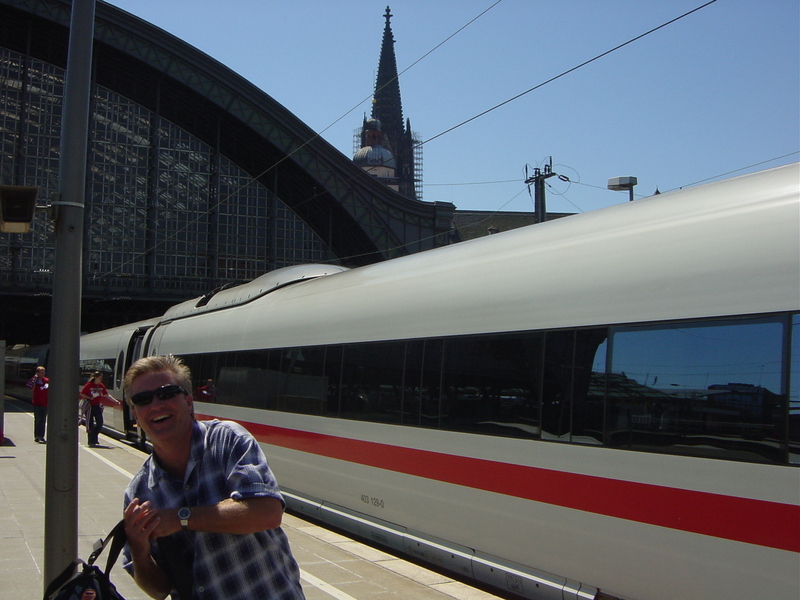 Germany Day 1 – arrival: We got into Frankfurt in the morning and immediately jumped on the high speed train for Cologne…spelled Koln there. We had comfortable seats in 1st class where we could look out the windows at the scenery & at the Autobahn where I noticed that some sweet Mercedez’s, BMW’s, Audi’s & Porsche’s were actually passing us. I looked at the monitor and it showed us doing well over 220 kph which is like 130+ mph! It was only about 90 mins for the trip and we got into Koln which is a cool looking city sitting on the Rhine river and has an Altstadt (Old Town) highlighted by a tall church dominating the skyline, called The Dom. The Bahnhof (trainstation) is right there by the Dom and we exited and made the couple block walk to our hotel on the riverfront. We couldnt check in yet so dropped our bags and walked thru the cool little streets to grab lunch as I was starved. Found a place and I grabbed a bier and some food…Erik just a bier. 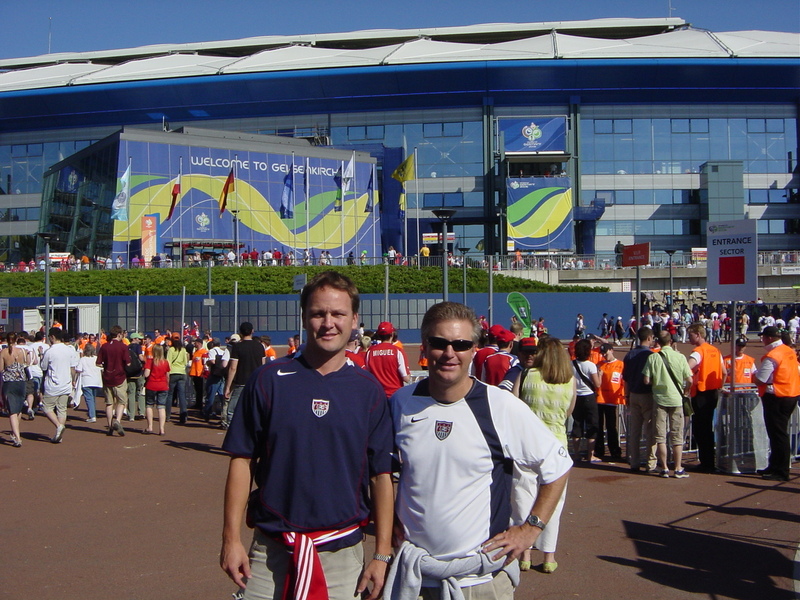 We had tix for USA vs Czech Republic that evening in Gelsenkirchen a few hours away so we went back to the hotel to shower & hit it. Now, the weather in Germany was super-warm & sunny but we figured it would cool down that night, so we grabbed sweatshirts to tie around our waists…more on that later. We had to train it to Gelsenkirchen thru places like Leverkusen & Dusseldorf. Plus we had to do a friend back home a favor and meet a guy named Hassel (or at least something like that as it was a hassle) & his son in G’kirchen station to give them game tickets. So we dont know what this phool looks like but we have a description…should be fairly easy, right? We get to G’kirchen station and the place is a PACKED MADHOUSE! Of course we had already been laughing at the idea of this and some German guy named Hassel and this caused even more laughter. But luckily we spotted a suspicious guy pretty quickly , only because we spotted his son, and Erik yelled “Hassel! !” It was him and we got the transaction done. Now we had to fight the packed crowd to get onto a tram thru town to the Stadium. We were packed like sardines but finally got onto a tram for the short trip…that turned into 15 minutes too long & 15 degrees too hot trip. Erik of course was making a scene with loud comments like, “hot in these trams!” and “is there a chance?”. We were ruing our sweatshirts which were adding to our weight & hotness. We hit the stadium, found our seats & reveled in the atmosphere. The US anthem was sung amazingly loud & then the entire US section was chanting “USA, USA!”…Erik and I had goose bumps. The game itself was a disaster and we got crushed 3-0. 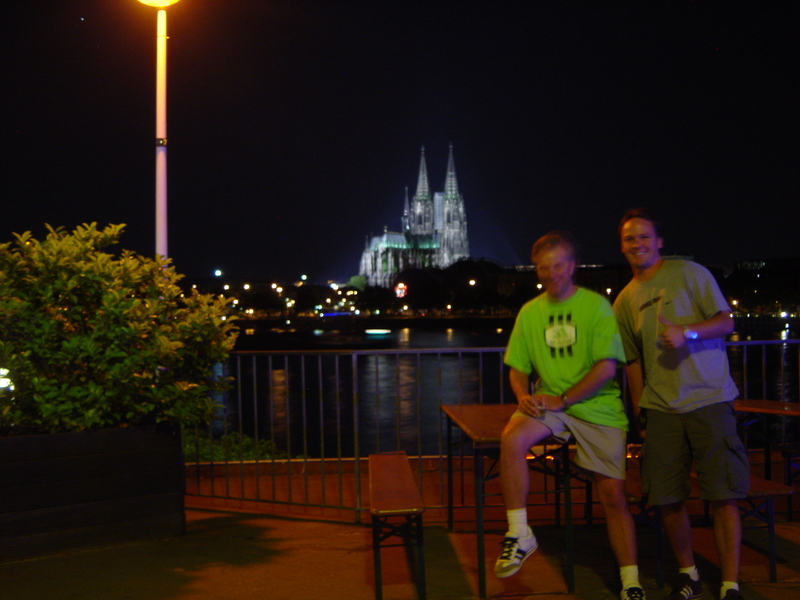 We hopped the train back & had to change in Dusseldorf, where Erik excitingly, and of course loudly, proclaimed it “Dummeldorf!” While we were waiting I saw a college teammate, Pat Preston, who was a senior my freshman year…I yelled & we got the chance to talk for a little while. That night we were still amped at being in Germany, having gone to the game & still adjusting to the time change. So we walked around and found a cool little tavern. In Koln they have their own special regional type of beer called Kolsch…its a type of lager that is cool, refreshing & served in small chute glasses, not the big steins you see in most of Germany, especially Bavaria. So we had a few & the bartender even wrapped up 2 glasses for us. Germany Day 2 – Koln: We got to bed late & of course slept in very late due to a long day and the time change. We got up & hit the old town of Koln. We stopped at an outside cafe & had lunch, Erik his 1st meal in about 36 hours! We walked around town, checked out shops, went into the Dom & hit the FanFest which is an area where they show the games on huge screens for free and have vendors & entertainment set up. During the group phase of the World Cup (1st 2 weeks) there are 3 games a day and for us they were at something like 3pm, 6pm & 8pm. We watched the 1st game at the FanFest & then met up that night with my prep-school roommate Achim, who is from nearby Konigswinter, Germany but was currently living in Brussels. He drove the couple hours to join us for dinner & watch Brazil in the night game. We had some biers, dinner & caught up while taking in the atmosphere created anytime Brazil plays (lots of people become Brazilian). When Achim headed back to Brussels, Erik & kept the night going and he wanted to hit some cool club he heard about. So we jumped in a cab which took us just across the river from Koln & wandered into some big club. Story becomes super-funny for 2 reasons: the 1st was we were wearing shorts & t-shirts (SLG a neon bright green one) and the 2nd would become aware to us soon. We walked in and the place was crowded with young, very well-dressed Germans. Erik hit the bar to grab us biers and I stood off to the side. As I was waiting a guy came up to me and started talking to me in German…I had no clue what he was saying and he soon realized I was American. He asked what we were doing there and with my response told me that the club was closed that night for a private party…a wedding reception. As he said that, Erik walked up with 2 biers exclaiming, “they gave me these for free”! They guy said we could finish our biers but we had to outside. So of course we laughed our asses off and headed out…but we did get some sweet pics of the old town from across the river…and of course many continuous laughs. Germany Day 3 – Koln & Germany game: Again a late start which didnt bother us as I dont always eat breakfast & Erik definitely doesnt. We cruised out to Koln’s Stadion which was hosting games to check it out plus pick up our game 2 tickets. We walked around town more and stopped to enjoy lunch and quite a few Kolsch’s at an outside cafe. Germany was playing their 1st game that night so everyone was festive..especially as it was against their rivals, Poland. We had made friends with the manager & another employee in our hotel who were from Morocco…they invited to hang out with them that night so we went back to the hotel to meet them. One picked us up and took us too his super-small apartment to meet up with the other guy…Erik & I were a bit nervous for 2 reasons: we didnt want to end up in some weird movie or piece of news & the Germany game was starting very soon and we had to get somewhere to watch it. We finally jumped in the car & drove into the leafy suburbs to a random club set on a huge property where they had big screens set up outside to watch the game. We enjoyed the game al fresco & reveled in a Germany win 2-0 & celebrated with the locals. 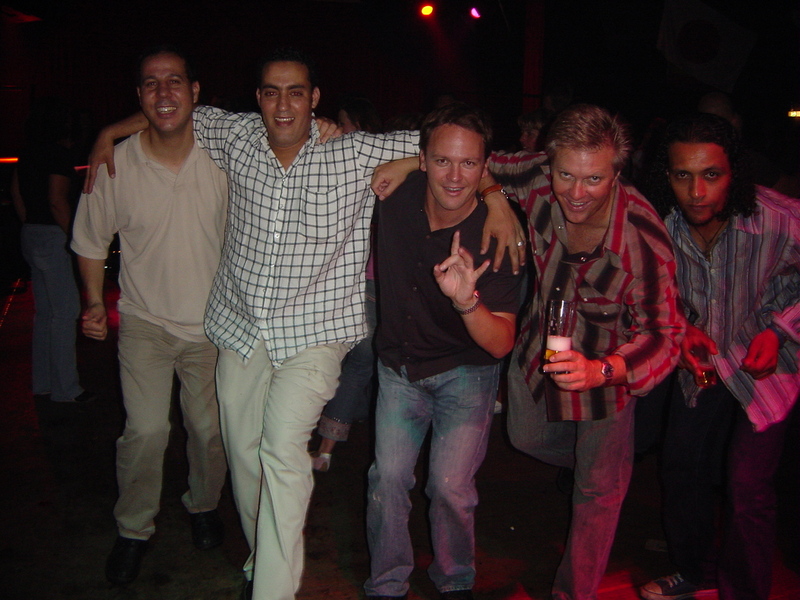 Then our crew of 2 Americans & 3 or 4 Moroccans went into the club that was simply called “Kantine”. Now this was Erik-heaven as it was filled with German cougars…not the cats but over 40 women. He & a couple of the guys danced around randomly while me and the other guys chilled and laughed. They took us back to the hotel late but it didnt stop there…we re-opened the hotel bar & sat there laughing, telling stories & taking pics for a few more hours. They loved Erik…1 maybe a little too much as he kept hugging him & laughing (see pics). We had such a good time I even forgot to check to see if the Heat game was on…they were in the NBA Finals vs Dallas (who have Dirk Nowitski from Germany) & I kept trying to see the games in the middle of the night. 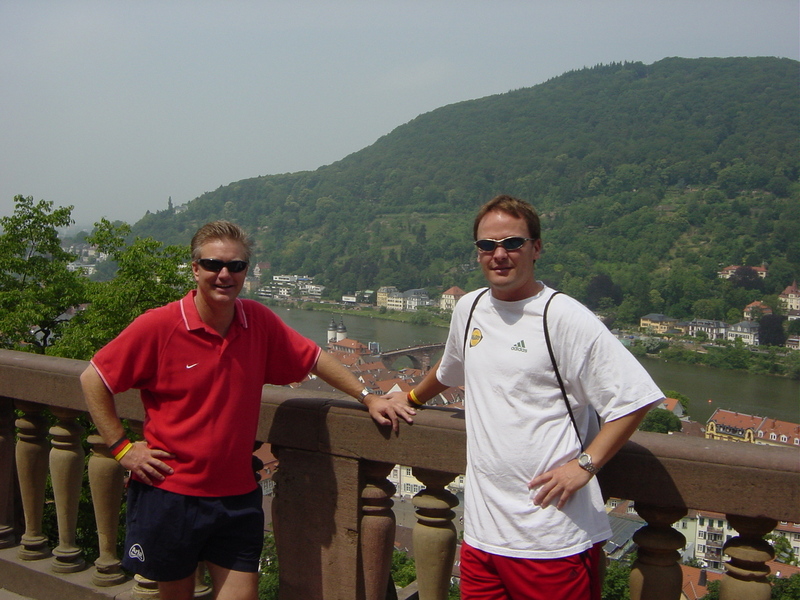 Germany Day 4 – Koln to Heidelberg: Today was a travel day as we were done in Koln & headed for Heidelberg. So we checked out & jumped on a train with a change in Mannheim. It was only a couple hour journey & we got to our hotel in the afternoon. Heidelberg is a cool, smaller city on the Neckar River near where it meets the Rhine River. It has a University, US Army base and a picturesque old castle sitting atop a hill over the Altstadt(old town). We checked into our older style hotel & waked thru the old town taking it all in. That night we hung out at local bar/restaurant & watched games & met some guys from SoCal that were rooting for Mexico. Germany Day 5 – Heidelberg Schloss: I mentioned this hotel was a bit older than our previous…well it had no AC and as it was a major June heatwave in Germany we kept the windows open that night. Also in the typical European style, twin beds were basically a double bed separated by a narrow divider. We woke to the screeching & honking cars crusing past the hotel…Erik thought we were staying on the AutoBahn (highway). So we got up & had our 1st breakfast & hit the old town to walk up to the Schloss (castle). We made the trek up and got some good views & pics overlooking the town & river. Inside the castle they had huge wine barrels with a tasting going on…so of course we partook. A few glasses later we were feeling good & refreshed and made our way back down into town for lunch. We sat in a cool, open square & I made Erik order the wienerschnitzel with fries…I got pics of him eating. Then we noticed a wedding reception in the middle of the square so I sent Erik in to crash…he did, getting us more free drinks & some pics. Erik standing out of the well-dressed crowd in his shorts & red shirt. We then hit another spot to watch the 1st game of the day & met 2 nice guys from St Louis who were there with their wives…they sent their wives shopping while we all enjoyed biers & the game…a 6-0 thrashing of the Ukraine by Argentina. We sat outside & enjoyed the sun, soccer & the atmosphere waiting on the 2 other members of our traveling party: Erik’s friend Bob Steib from Manhattan Beach & his friend Tom who lives in Thailand. They were joining us for the remaining part of the trip. We chilled that night outside watching games & catching up. Germany Day 6 – USA vs Italy: Well we had a somewhat embarrassing but hilarious start to the day. I mentioned this was an old hotel & the rooms had 2 doors to open to get in and we never locked ours. Erik & I were still dozing and I heard someone open the outer door to our room…I figured it was Bob or Tom as they were down the hall, so I just opened my eyes as I was facing the door. The inner door opened and to my surprise it was some random guy…it took him a second to look up and realize he was in the wrong room…he saw Erik & I laying in our beds that were of course too close for comfort, each in just boxers & no blanket covering us as it was so hot. He quickly said sorry and exited. I jumped up & yelled at Erik & we laughed for about 20 minutes. 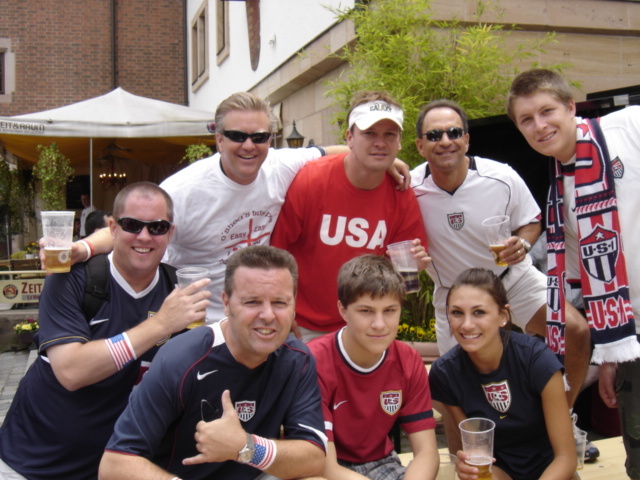 So this was USA gameday #2 with the US playing the much hated Italians in Kaiserslautern. So the 4 of us jumped on a train for the 1 1/2-2 hour ride. We got to the small city & it was hopping! USA & Italian fans everywhere in the streets partying, singing, chanting, etc. It was actually the base of Trinidad & Tobago so their fans where all there and we saw a cool parade of them thru town. We had hours to prep for the game so we hit a bier garden 1st, then a FanFest to watch the 1st game of the day…another gorgeous sunny day to be outside. With all the US fans there I was to meet up with a few friends of mine: Joe McGovern (who by 7 degrees of separation i met thru Schif who had played at William & Mary together…I would later go to EURO 2008 with Joe & WC 2010 South Africa with Schif); Will Ris & his future bride Laurel who I worked at the Galaxy with; and Tito Fonseca who worked with me at Galaxy. So we somehow all connected at the same place & tailgated with all the US fans for the game. We all made the fun 1-mile walk up to the stadium immersed in crowds of USA fans, Italian fans & even 2 Norwegian fans who made the trip even though their team didnt qualify. Of course Erik had a shot with them as he is Norwegian (parents born there & he speaks it). Erik & I sat together away from everyone else and much to our chagrin we were tucked in a small group of about 20 US fans surrounded by Italian fans. It was loud & raucous & the game was intense…we went down 1-0 but came back to tie it 1-1. Then their guy elbowed our best forward and got a red card…very dirty play…USA up a man with a great chance to win. We were playing well & had some chances but then 1 of our players got a red card…questionable call by the ref, should have been a yellow card…so now both teams down a man. Then the ref gave our defender a 2nd yellow card thus earning a red card & expulsion…so USA now down to 9-men vs Italy’s 10. 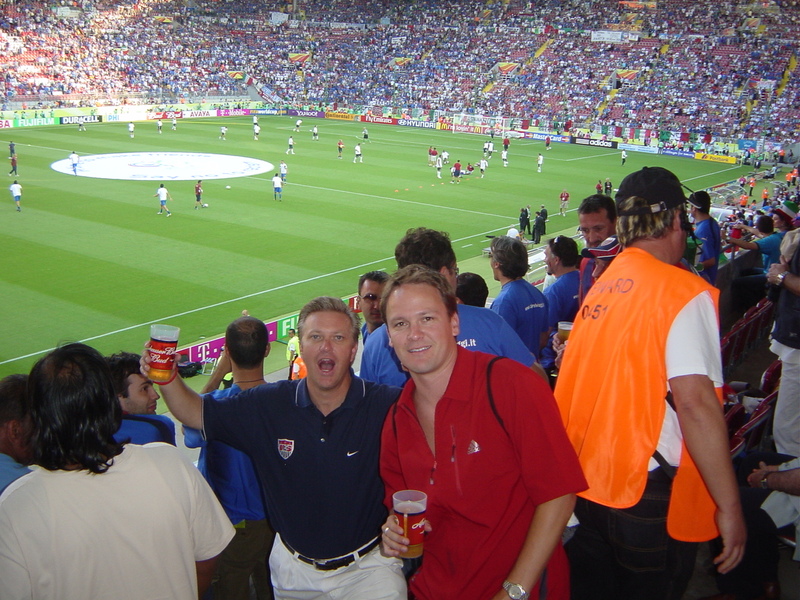 Then the US scored and Erik & I threw our almost full biers into the air & into the Italian section next to us…as we were jumping up and down everyone realized the goal was called back…the ref called offside on a very questionable call yet again…disaster! No goal & no beers. We hung in tough for the tie which was partly a great result but also very frustrating as we felt we had been better than the diving, lame Italians & cheated by a crap referee…definitely watch the highlights here: USA v Italy. The train trip back to Heidelberg was a frustrating one as we had headaches from yelling so much, just about lost our voices & didnt know why our goal was called back. 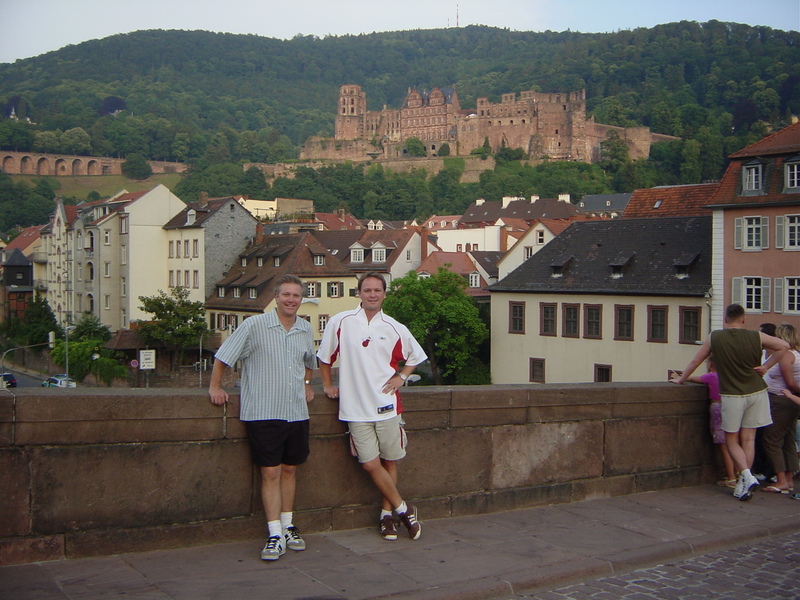 Germany Day 7 – Heidelberg to Munich: This was another travel day as we headed out of Heidelberg for Munich (Munchen). But this time we were driving as Bob’s company has an office in Germany & he got a 5-series BMW with navigation to use. So with hit the Autobahn with Bob at the wheel & cruised thru Stuttgart & into Munich after a couple hours with Bob hitting 200+ kph. We checked into our hotel in town & then were to hit the Brazil vs Australia game at 3pm…Bob & Tom had tickets, Erik & I didnt as we were supposed to but my hookup failed me. So we all jumped on the subway for the amazing new stadium there, the Allianz Arena. Again the trains were packed & this time in all yellow as both teams wear it. We got to the stadium in hopes of scalping 2 tix but with no luck. So Erik & I took a couple pics & wished the other 2 fun at the game while we grabbed a nice Mercedez cab back into the old town. We grabbed lunch & biers at an outdoor cafe (that was pretty much the norm) & mingled & watched the game on TV. Another growing trend was Euro’s deciding to smoke right next to us or basically blow it on Erik…this time a guy at the next table had his cig held up & it was right behind Erik’s head with the smoke blowing on him…comedy ensued. We cruised old Munich & headed for the famous Hofbrau Haus…this brewery was founded in 1589 by the Duke of Bavaria. It is a big place with tons of big, long wooden tables both inside & out with everyone drinking, eating, singing & dancing. We grabbed the end of a table next to an Italian guy and his 3 kids. Now this is big beer stein territory & we indulged. I even got a couple pics with the little kid next to me holding both a full & empty stein. Bob & Tom met us there after the game & we all drank, chanted & sang with the other fans…as a matter of fact it would go in spurts. The Germans would do a loud German drinking song, then the Aussies would do their drinking song, then the Brazilians and so on…it came to us and we said we didnt really have one for the US so we just did the old reliable “Ole, Ole, Ole, Ole”! We got some great vids & pics. We finished the night watching South Korea play in a swankier bar downtown. Germany Day 8 – Neuschwanstein: The plan was to drive south into the Bavarian Alps to a town called Fussen near the border of Austria to check out 2 castles: Neuschwanstein & Hohenschwangau. So this was my day to drive & we headed out of town onto the open highway that is the classic autobahn…here there are no speed limits and it was fun to pass a cop and not worry about it. I topped it out around 210 kph (approx 120 mph) & then we turned off onto country 2-lane roads. It was a nice, couple hour drive with great scenery & we approached the hills and got our 1st glimpse of Neuschwanstein…for those that dont know it was built in the 1800’s by King Ludwig II of Bavaria who was often called Mad King Ludwig and was the inspiration for Sleeping Beauty’s Castle at Disney. It sits at the base of the foothills/mountains perched overlooking the valley and its probably the coolest castle in Europe. We walked around & got some good pics of it and the lesser Hohenschwangau Schoss next to it. We had a nice outdoor lunch & cool Bavarian bier before heading back to Munich. That evening we met up with my friends Brian & Dondi Kingsbury who live by me in Redondo Beach. We watched a game at a cool outdoor beer garden & then headed over to the Hofbrau Haus. The place was jumping again & we randomly ran into Will & Laurel…we didnt even know they were in Munich. So it was another night of Hofbrau fun toasting, chanting, singing, etc with our group that was now about 12 strong. The night ended with a walk back to our hotels which were close to each other, stopping for a late-night slice of pizza & a shot of jagermeister (that hurt). 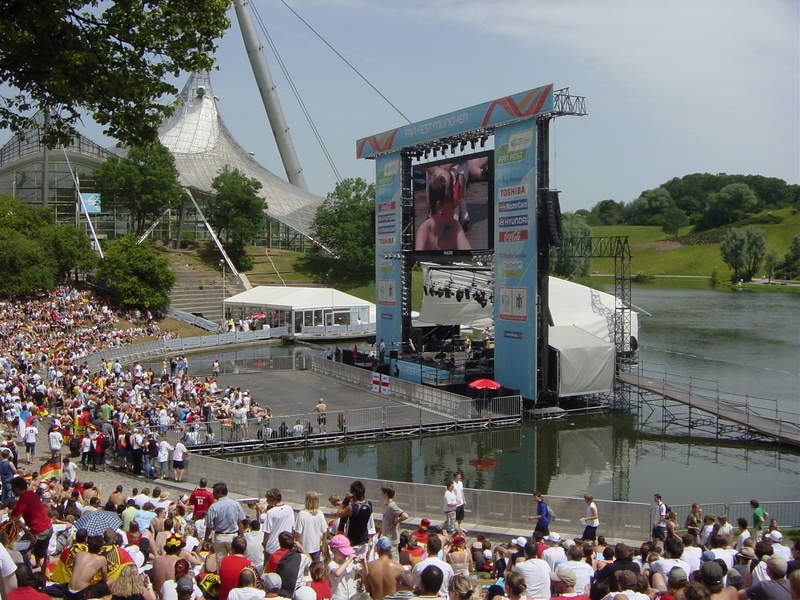 Germany Day 9 – Munich FanFest: We spent the day walking around & then headed for the FanFest at the OlimpiaStadion (site of ’72 Olympics & Bayern Munich’s old stadium) to watch England vs Sweden and then Germany vs Ecuador in their last group games. This was an awesome setting with the giant screen set up on a little lake at the bottom of a natural amphitheater. For the 1st game we had a nice spot at a table under an umbrella as it was hot & then grabbed a prime spot up on a tower overlooking everything for the 2nd game. England tied 2-2 & Germany won 3-0 so it was a fun day & evening…and we ran into my friend Pat again…the only thing that sucked were that my allergies were kicking and I sneezed 8000 times. 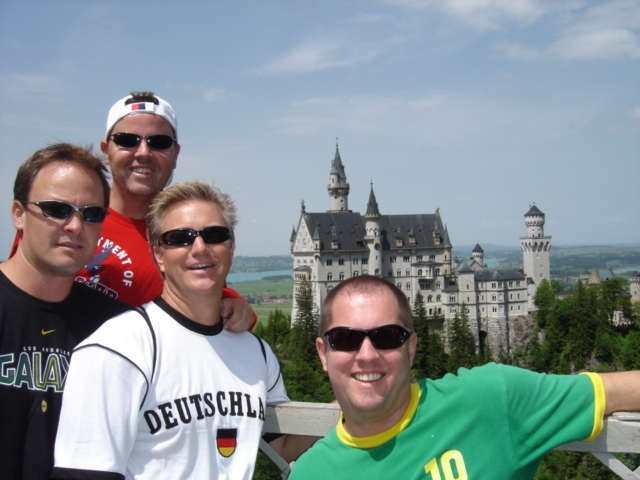 Germany Day 10 – Munich to Nuremburg: Another travel day as we hit the road for Nuremburg just an hour or so north. Bob was at the wheel again and hit some high numbers on the speedometer…Smart & I were a little scared in the backseat & told him to keep it around 200 kph at most. We got to our very nice hotel right at the entrance to the Nuremburg Altstadt (old town) and there was a lot of noise & people around. We figured out the noise was a large group of Ghana fans gathered at the back entrance & that the team was staying in our hotel…we saw the team bus roll up & let all the players in & shared a few trips in the elevator with some of them…including Michael Essien, their best player. We headed into the old town & stopped to enjoy a beer garden and some nuremburger sausages…which are atypical German brats…they are smaller & served in 3 on a roll…and they are good. SLG met the Burgermeister (Mayor) of Nuremberg who was sitting next to us. Then we had lunch at a place called The California Grill…weird but almost like the taste of home. Then we headed for the Schloss which sits at the top of the hill in the old town overlooking all of the city. We got some good pics & then headed for the center of the old town for a huge beer garden that had taken up the huge center square. We watched games, drank, ate & mingled with the crazy Germans around us. 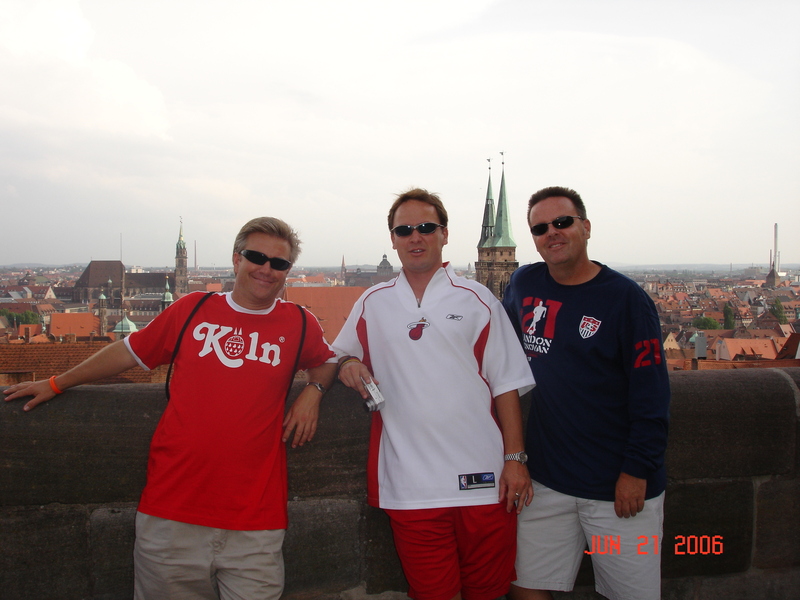 Nuremberg is a smaller city & less people spoke English but we had plenty of fun. Super Loaded Guy even pulled one of his loud falling tricks as he fell off the back of our bench & caused a scene which all the Germans around us loved. We of course spent the entire afternoon & night there…where I found out the Heat had beat the Mavs to win the NBA championship, led by my cousin, Dwyane Wade 😉 Later that night we headed back to the hotel…Bob & Tom went to their rooms but Erik & I had the goal of keeping the Ghana team up all night by being loud. So we hit the hotel bar & ended up sitting by Marcelo Balboa, former USA player & now announcer & 4 guys from South African World Cup committee who were working with FIFA on setting up 2010 World Cup in South Africa. Erik asked them what the chances were that they would end up being able to host due to crime, bad infrastructure, no hotels, etc…3 of the guys said no problem but the last 1 said it could be…well Erik decided there that he wasnt going to SA and we all know now that it was no problem and turned into one of the greatest trips ever…your bad Super Smart. We did our best the rest of the night & on the way back to our room to be a little loud. Germany Day 12 – Flight home? : So the journey was coming to an end and this was our last day in Deutchland. Tom was heading one way while Bob, Erik & I were driving with one of Bob’s German co-workers to Frankfurt to drop us at the airport. Its probably a 2-hour drive and of course I started getting a little queasy right at the end…Erik looked at me and recognized the signs as he had seen it before on our windy drive to/from Big Sur (where I puked out the window) and of course started dying laughing and heckling me. But we pulled up to the airport just in time and I jumped out of the car (its a backseat, no view ahead, windy road thing that gets me). We checked in & got on the plane for a long trip back…but then just as we were to taxi out they came on and told us we would be delayed for a mechanical problem. So we sat there for a couple hours until we finally took off. Then a couple hours into the flight the pilot came back on and announced that the little “mechanical problem” had turned back up and we had to make an emergency landing in Keflavik, Iceland. We were all shocked & confused but here it was coming up outside the windows, the coast of Iceland. So we land & they keep us on the plane for a while, saying that they were going to fix it while we stay on the plane. I told Erik there was NO WAY that some random Icelandic dudes would be able to fix it…we had been in Germany where 1st off US Air flies & 2nd where they are known for making great machines. I pictured Sven & Bjorn outside scratching their heads. So of course after an hour of continuous updates from co-pilot Steve they finally let us off the plane. Now this airport is no LAX, Heathrow or Atlanta…there was 1 gift shot, 1 duty free & 1 little bar. So we all ravaged the gift shop & then had nothing to do. Erik & I had vowed no more beer after 12 straight days of getting our fill…but we decided to belly up to the bar & try some Icelandic beer. We had a couple & they were strong & of course Super Loaded & Loud Guy came out…soon we were joined by 2 US guys each traveling alone…then another & a couple girls. Everyone else was sitting or watching us or talking on the phone or trying to get answers from these Icelandic airport employees who dont even have US Air fly there. Finally the flight crew comes out & Erik grabs what looks like a pilot…turns out its co-pilot Steve! We ask him if we are getting outta there and he replied, “not a chance”, and they all left together. After a couple hours they announced they would feed us upstairs so we headed up to a cafeteria with a few beers…our little party was now around 7 or 8 people. We grabbed some food, played some games & talked about going into town which is the capital, Reykjavik. We finally got permission to leave but they told us to be back by 3am. One guy was more Super Loaded than Erik so we wanted to leave him behind but he stumbled along with us. We jumped into a van-cab & Erik translated & the driver did speak good English (Norwegian is similar to all Scandinavian languages including Icelandic). It was about 11pm but it was also late June and about the longest day of the year, so the sun basically dipped below the horizon keeping it somewhat light all night. We hit a cool Irish pub and met some locals. One then took us to a nicer club. There I told him I played college soccer with a guy from Iceland…he called 411 and asked for Hilmar Bjornsson…there were like 15 of them. So we narrowed down & dialed…a lady picked up, I asked for Hilmar & a guy got on the phone. I said “Hilmar”, he said “yes”, I said “Hilmar Bjornsson”, he said “yes”, I said “Hilmar Bjornsson from UNC Greensboro”, he said “yes”…I yelled, “its me Chris Wode, I’m in Reykjavik”! He exclaimed, “what? !” and we talked for a quick minute before he said, “where do you live?”, “I’ll call you when I come to LA” and hung up….it was the middle of the night. So we finally all decided to head back to the airport except we couldnt find Super Loaded Guy #2…the girls wanted to leave him but I gave a quick look back at the Irish pub…he was gone. So we jumped in our same van-cab and started our 25 minute drive back to the airport. About halfway and the driver gets a call, he asks if there is a Mike in the car, who is one of the random guys. He gets on the phone, talks to someone and gets off and tells us that SLG #2 was at the police station. It was the police that tracked us down & called us to tell us they picked him up staggering around town. We said we didnt really know him and had to get back to the airport for our flight. We spent the night on the floor of the airport only for security to wake us all up super early in the morning as people were coming in for flights. We finally found out that US Air sent another plane for us which would be there around 10am. We finally started boarding and Erik & I were laughing & looking for SLG#2 to show up…he never did and we flew back to Philly. Final Day: But it doesnt stop there…we get to Philly & they book us on a flight to LAX. Erik got somewhere in the back and I got 1st class…Erik was stupified, I was gloating. So I’m sitting there behind Bruce Jenner & we taxi out & just as we are next to take off they come on the PA and announce we have to sit there for an hour for weather delay! Erik came running up the aisle going crazy wondering if we were ever going to make it home. Well we did and after something like 36 hours of delays we landed at LAX. What a trip! At this point of my life I would definitely say it was the best trip I had ever been on and probably still is. Lesson, dont take US Air to Europe…though they did hook us up with a free voucher for flights that I worked into 2 free flights to Miami.